As I slowly glided through the racetrack’s arches and slid to a halt long before my defensive driving instructor blew the whistle, I knew that the power of the Volvo was wasted on me. I didn’t doubt that her dark sunglasses hid a deservedly dubious glance. I reminded myself to tell Samantha – loudly enough for the other group members to hear – that I hadn’t driven a car for five years. Memories of what I was supposed to do on the road were so foggy that I couldn’t remember whether a U-turn involved reversing, and trying new tricks seemed beyond me. 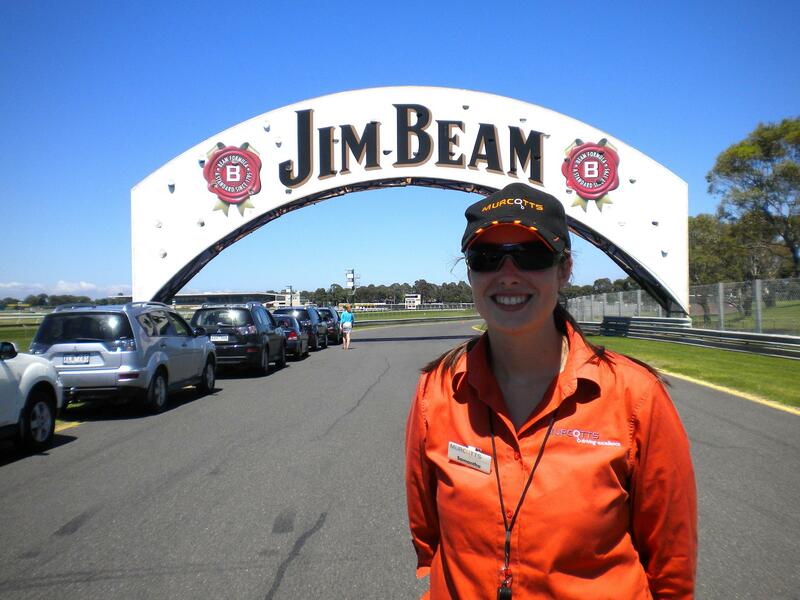 I was even more embarrassed by my performance 10 minutes later, when I learnt that Samantha is one of Australia’s few female racing car drivers. “Sure,” I replied weakly, before driving back to take my place in the queue of parked cars. We were supposed to be checking the response time of our ABS (Automatic-Brake-Systems), but the exercise left me quivering. I suspect that many people in Australia are encouraged (if not coerced) into taking a defensive driving course after losing their licence for speeding or other road safety violations. As well as hearing a number of people claiming (with ironic defensiveness) that a particular accident “wasn’t my fault,” my guess was proven to be reasonably correct when Samantha told me, “We’re usually trying to knock the confidence out of people – but with you, we’re trying to put it back in.” I attended the course to assuage my father’s worries, as he fairly reckoned that my driving skills needing brushing up before (not literally) hitting the Australian highways. As I would be driving his expensive and beloved car during my five week stay in Melbourne, I was not in a position to decline the booking. Australia is a very safety conscious nation – I recall a law lecturer once telling our class that it is the most highly legislated western nation in the world. After returning to Melbourne after spending a summer in Europe, I noticed for the very first time that escalators (which I presume are one of the safest means of transport) are frequently plastered with warnings such as, “STAND INSIDE THE YELLOW LINE,” “KEEP YOUR HAND ON THE RAILING,” and “HOLD ONTO CHILDREN.” And so on and so forth. Sometimes it’s amusing; at other times irritating, but at the end of the day, it’s mostly sensible. However even Murcott’s chief driving instructor “Dave” admitted that he hadn’t memorised Australia’s 450 road laws (which include four pages of legislation on the use of mobile phones – he describes them as “confusing”). On a more serious note though, the concept of defensive driving is a smart addition to the basic knowledge it takes to get a licence, and the knowledge it imparts has saved countless lives. Courses such as the one I attended at Sandowne Racecourse teach drivers how to be more aware of others on the road, and how to prepare for the unexpected, such as sudden braking and plain old bad driving. At the beginning of the day-long course, we were provided with a sobering statistic: 25 million people have been killed on the world’s roads. In Bangladesh, it is estimated that over 20,000 people die every year. Leave a two second gap between your car and the vehicle in front of you, so that you have time to brake if they do. This does not mean, as someone in the class suggested, “Leaving a gap as long as two elephants” because the distance changes according to the speed you’re travelling. On Dhaka’s congested streets, a couple of metres may suffice if the pace is slow. In reality though, it will be hard to avoid rickshaws and CNGs from taking a mile from your inch. However it’s worth highlighting that “tail-gaiting” is hugely dangerous and that reducing your speed by as little as five kilometres can give you crucial extra metres you may need in an emergency situation. Do not speak on the mobile phone or text while driving. I was advised that even speaking on a hands-free device is dangerous – because the person on the other end of the phone cannot see the conditions ahead of you, and unlike the hypothetical passenger, will not pause their conversation during a tricky intersection or other hazard. In fact, according to information provided by Murcott’s Driving School, the first 30 seconds on a mobile phone are considered to be as dangerous as driving with .05 alcohol reading (which is roughly more than having two standard drinks within an hour, and is illegal in Australia). According to Dave, who has more than 20 years of experience in road accident rescue, “Objects lying around in the car are missiles in collision.” If you survive the impact of hitting another car, being hit on the head by a flying laptop or briefcase could tragically prove more difficult. Dave was at pains to point out that passengers and drivers not wearing a seatbelt are also a missiles in collision. To back up his point, Dave showed us horrific slow-motion footage of an American taxi driver being hurled around the interior of his car. Concentrate. Dave estimates that most drivers concentrate somewhere between 40 and 50 percent of the time, which is obviously unsatisfactory when considering that a person travelling at 60 kilometres per hour covers 16.6 metres per second. A lot of damage can be done if you take your eyes off the road for just a second. In order to provide you with information most relevant for driving conditions in Bangladesh, I made a video recording of traffic in Moghbazar before I left, which I presented to an instructor at the end of the driving course. Unfortunately, my request for a bit of free expert advice was declined, because “It would first need to be cleared with the public relations department.” When is “safe,” too safe, I wondered?